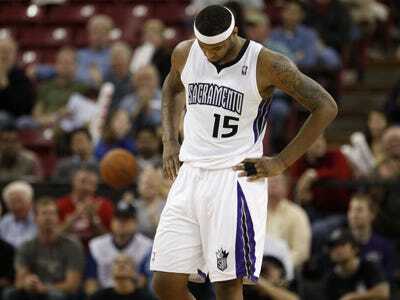 Just over halfway through his rookie season, DeMarcus Cousins has already caused more than a few headaches for the Sacramento Kings.Cousins’ latest incident came Saturday when he reportedly came to blows with Donte Greene after Greene failed to inbound the ball to Cousins with seconds remaining in the team’s 99-97 loss to the Thunder. Cousins was kicked off the team’s flight and has been suspended. The Kings knew the risk they were taking when they made Cousins the fifth choice in the 2010 draft, but the promise of an automatic 20-10 machine was too appealing to pass up. Cousins came as billed. He has character issues out the wazoo (he’s an awful teammate, has a major temper, and can be extremely lazy), but he has incredible potential. He hasn’t turned into a dominant post presence yet, but his averages of 13.9 ppg and 8.1 rebounds are nothing to scoff at. In fact, only two 20-year-old centres in league history, Shaquille O’Neal and Dwight Howard, have averaged more points and rebounds than Cousins. He’s already the subject of trade rumours, which the Kings deny, because of his troublesome attitude, but for now at least, the Kings made the right choice by taking Cousins. Unlike in past years when it was easy to critique the Thunder, for example, for taking James Harden ahead of Stephen Curry, there’s no obvious star that was selected after the Kings’ choice. Greg Monroe has performed well lately, but so far the rest of the first rounders have been underwhelming. That has to be reassuring for the Kings. They don’t have to do much second-guessing, because there isn’t an obvious star they could have had in Cousins’ stead. Same goes for Kings fans. They might be annoyed by Cousins, but there isn’t anyone they’d like to swap for him. Cousins has been maddening at times, and that’s not something that’s likely to change in the near future. But as long as he performs at a reasonably high level on the floor, and nobody taken after him emerges, it’ll be much easier for Sacramento to live with its decision.